This is the intermediate level of our 3 part Quickbooks Course. 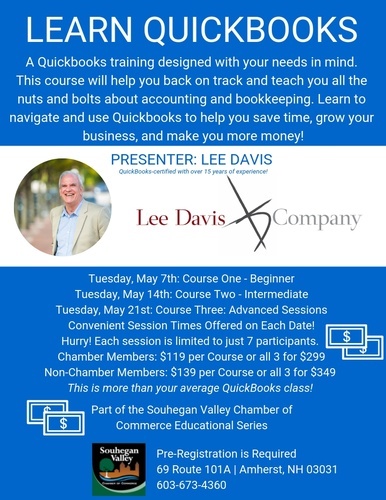 Join us for a comprehensive, hands-on Quickbooks Course that will help you get you back on track and teach you all the nuts and bolts about accounting and bookkeeping. You will learn to navigate and use Quickbooks to help save you time, grow your business, and make you more money! Two Sessions offered: 9-11:30am and 1-3:30pm --Hurry! Maximum of 7 people allowed in each session. Participants will be required to bring a laptop computer as well as a notebook. If you prefer using the desktop version of Quickbooks, please make sure it is downloaded onto your computer. Each session is tailored to you as an individual! Participants will be required to bring a laptop computer as well as a notebook. If you prefer using the desktop version of Quickbooks, please make sure it is downloaded onto your computer. This is not your average QuickBooks course and not exclusive to online vs. desktop. A $600 value for much less through the Souhegan Valley Chamber! About Lee Davis: We are pleased to be partnering with certified Quickbooks Instructor Lee Davis of Lee Davis & Company. Lee brings many years of experience as a former college professor having taught business and accounting courses. He then spent decades utilizing his accounting and business skills in the health care industry. For the past 10 years, his passion has been helping new business startups and young entrepreneurs with his business and accounting expertise.